Thanks for the comments. I realize that my issue is with the bank that issues my credit card. They are ultra cautious and are quick to reject or flag suspicious activity. It’s all in their automated system. I was only trying to put a warning out there for anyone that may run into problems like I do. If it helps anyone, I am in the US and use 5/3 Bank (I.e. Fifth Third). International transactions can be a challenge with them. Seems strange is this day and age though when many people are buying from foreign countries, maybe not so many Americans do. I bank with Barclays Bank and they even convert the payment into JPY to make it easier for CDJapan. It is getting more common, but it’s still fairly rare for people in the US to order internationally (excluding orders through Amazon or US based company that ends up shipping the item from another country, even then the financial transaction happens in the US). Sometimes CD Japan gets bonuses that weren't advertised ahead of time anyway. I have about 10 Scandal posters that I got from them and only about half of them were ever listed in advance. But I'm not counting on it; the magazine itself is enough of a bonus. Too bad there's no DVD version this time; that's what I usually buy. OK, I got my order in at Amazon for Limited A with the early purchase benefits. Now I'll be too excited to sleep for the next 2 months! And while I was looking, I had to add the Japan Title March Blu-ray to the order. That should maximize the glorious torture of anticipation. By the way, the Best Xmas setlist said the New Song was Masterpiece. Was the New Song in the setlist for the Kanshasai shows also Masterpiece? Who has heard them perform this live? 2many2no wrote: Was the New Song in the setlist for the Kanshasai shows also Masterpiece? Yes. The very first time they played "Masterpiece" (title was still TBA) anywhere was during the first stop of their Kanshasai tour (link). They then played it at every stop of the tour. We debuted this song at a few of our live shows last year. We hadn't announced the title yet, but there were many people who heard the song. It's a punkish, cool, speedy song. I wrote the lyrics while MAMI wrote the music. I think it'll be a killer tune at future shows. A really cool song. It's a starting song for us. 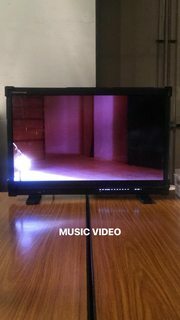 After only two days in a recording studio, they shot the 'Masterpiece' music video today. I can't wait to hear their new single! I have a feeling the girls are in full confidence on their newest composition. Maybe it's just me that none of my favorite bands/artists shared their process of production in real time before. Sometimes will include a DVD of making of the album or off shot movie stuff like that! This time is like Scandal inviting us to follow them all along the way every step till the release of the physical CD. 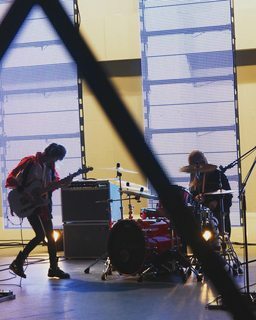 February 14-16 - SCANDAL records "Masterpiece" and shoots its music video! 2many2no wrote: Who has heard them perform this live? I have. Twice (saw two shows in Osaka for Kanshasai). I'm excited to see the MV, I'm liking thier look so far, especially Rina and Haruna's. 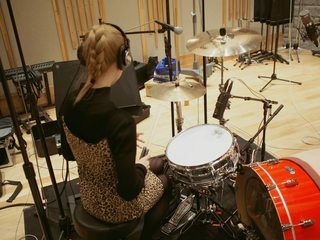 izzy wrote: After only two days in a recording studio, they shot the 'Masterpiece' music video today. I can't wait to hear their new single! They don’t waste any time that’s for sure. I’m so excited to for their new single! They haven't recorded Mabataki yet? Who has heard them perform this live? Thanks! 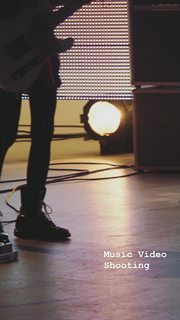 Your blog was great, it really brought back the feeling of seeing them live. I bet the combination of new songs and deep cuts was off the hook! 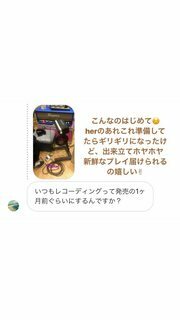 izzy wrote: They haven't recorded Mabataki yet? They seem to do about a song a day. Every band works a little different; some bands write and record in the studio, then hang around and help out with the mixing, obsessing over every little detail. Those bands can be in the studio for 6 months. The Beatles were basically *always* in the studio towards the latter part of their careers. 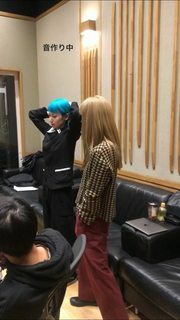 Scandal seems like they come in with songs already done and practiced, they record and they get out. It usually seems like they do entire albums in a week and then move on to other tasks. Then they just leave it mostly up to the engineers and production team to mix it and clean it up for release. This is a great method they got going on. Coming into the studio with songs already written and rehearsed is not only wise for working out a tune ahead of time, but they must save a boat load of money this way. Could you imagine how many songs they could record if they could spend Fleetwood Mac "Tusk" level money? I'm not sure if Boston still holds the record for spending the longest studio time for an album. 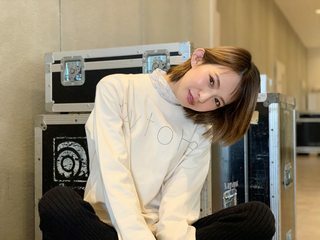 Since Scandal had performed Masterpiece live that means the song was well written for quite sometime so they are familiar with every bit. They only need to go into the studio to lay down the track and let the engineer to do the rest. 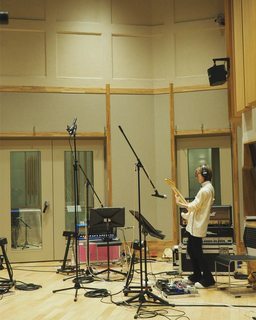 I'm sure the studio time is very expensive in Tokyo like Hong Kong. 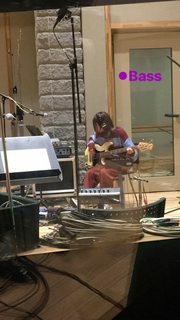 February 18 - SCANDAL starts recording "Mabataki"
To record "Masterpiece", Haruna used her white & gold Telecaster, Mami used her blue Les Paul and Tomomi used her Yamaha BB. 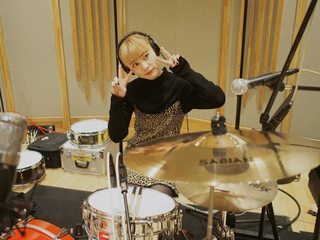 Rina seems to use the drumkit from the Honey Tour. Do we know how long they practice their instrument a day? I know they have rehearsal once a week, but I guess they also work a lot on their own every day. 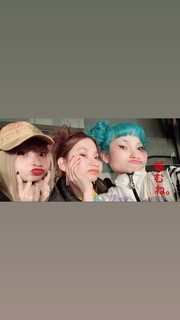 I wonder if Mami composes the music alone and then presents the complete songs to the other members of the band or if it is a more collective work? 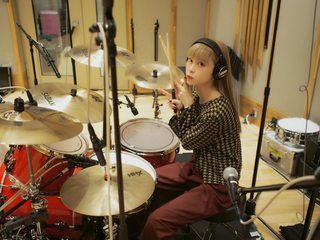 I like how Rina is always dressed up even for a recording session. 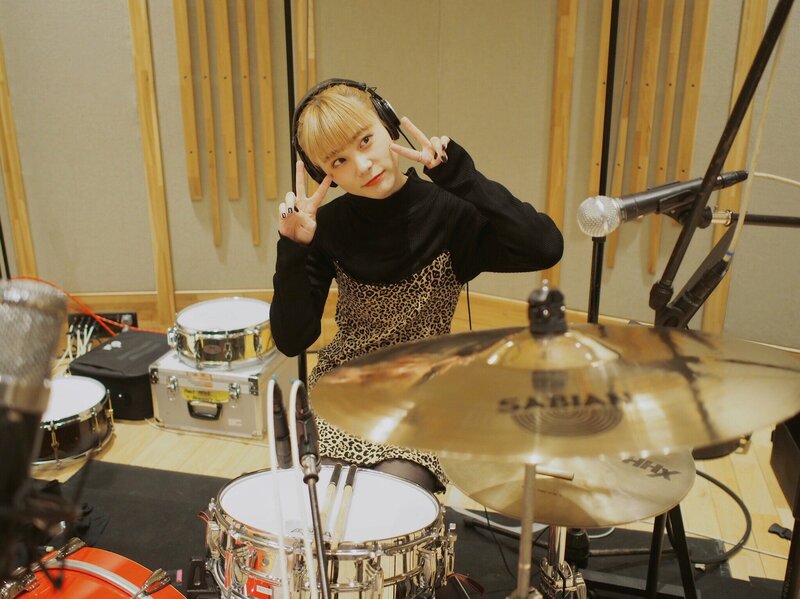 I don't play drums, but I would think wearing a hip-hugging dress like that would have it's challenges behind the kit. She's probably very used to it. 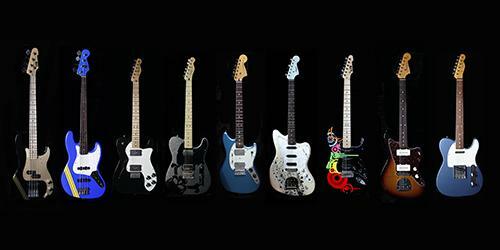 Seems like she was also using her sonic gray telecaster and her guild m 75 aristocrat. 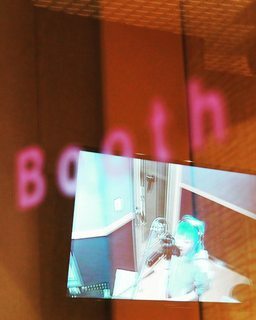 edit: those are actually used for mabataki's recording, just realized after checking again, my bad. 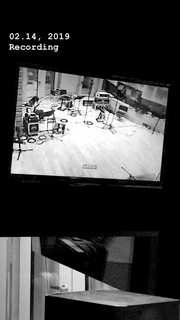 All these shots of them recording the song are making me really excited for the release! Do we know how long they practice their instrument a day? I don't think we do at this stage. My guess would be not much, if at all. At a certain point you hit diminishing returns, and other stuff you want/need to deal with eats up your practice time anyway. At this point they've all been playing for well over 10 years, so they're probably not going to continue to improve much in technical terms even with a lot of practice. I'm sure they probably *play* occasionally even when they're not performing, which would keep their skills up (as would performing itself). In my experience, playing guitar and bass, at least, is kind of like riding a bike - I can be away from it for a long time and as soon as I pick a guitar up again, after a short warmup/re-acclimation, I'm right back where I was. 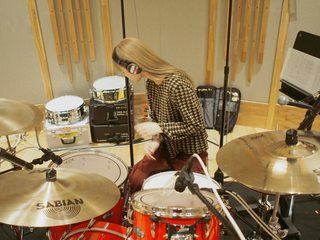 And maybe Scandal also learn new techniques once in a while; sometimes you still hear that on the albums (though often only on one song). But as far as doing scales and alternate picking exercises and stuff like that, I doubt they ever do that anymore. Of course they would have to practice new songs for some time after writing them, but that's a different thing from practicing an instrument.